Why Do I Need a Reel? A reel is a device that winds up and stores a hose or cable – making your job easier and your workplace safer and more efficient. A reel neatly stores your hose or cable to ensure it’s readily available wherever and whenever it’s needed—no tangles, no leaks, and no problems. A reel keeps your hose or cable off of the floor to avoid tripping and other workplace accidents that may cause work stoppage or costly insurance issues. A reel will lengthen the life of expensive hose and cable. Constant dragging or kinking can damage hose to the point where it becomes un-useable. Shorts in electric cable or leaks in hose can lead to environmental issues and other problems. What Type of Reel Do I Need? The type of reel you need is determined by two factors – what it’s holding (hose or cable) and how it will be used (live or storage). Start with the hose or cable you’ll be using. The size, length, and type are the primary factors in selecting the proper reel for your job, but the quality of the hose or cable is just as important. Hose Quality. Be sure to use good quality hose rated for the service and operating pressures and temperatures to perform your application safely and efficiently. Poor quality hose tends to expand and contract under pressure surges, causing the reel to bind or even become distorted and inoperable. Check for proper temperature and pressure ratings and compatibility with the fluid you will be using whether it be fuel, corrosive chemicals and pesticides or water. Cable Quality. It is important to use good quality cable, properly sized, with the correct number and size of conductors to carry the required amperage and voltage. Compliance with local electrical codes should also be considered. 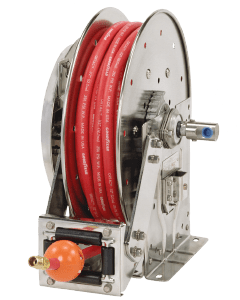 Live reels connect to your hose or cable, allowing fluid or current to pass through while still on the reel. 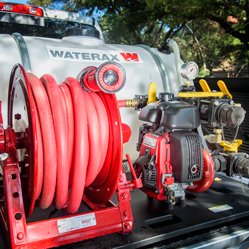 Continuous-Flow Hose Reels come as live single hose reels or live dual hose reels, and are built to specifically handle a variety of liquids and gases. 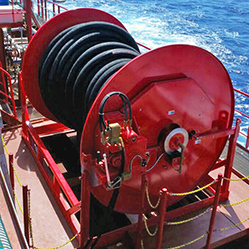 Live Electric Cable Reels can be customized based on the number of conductors and connectors, voltage, amperage, and cable specifications for your situation. Storage reels wind up your hose or cable, but do NOT allow fluid or current to flow while still on the reel. The hose or cable must be taken off the spool of the reel to be connected and used. How Do I Select the Right Reel Model? Once you know what type of reel you need (hose vs. cable, live vs. storage), it’s important to understand the available options and your specific needs to ensure a perfect fit. 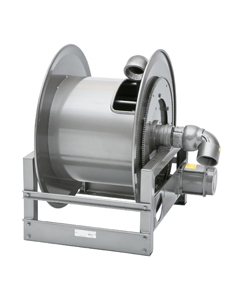 Hub Assembly (Hose Reel): The heart of the hose reel comes in standard, standard with optional flanged riser, and optional two-way. Rewind Options: Options include manual (hand crank, gear-driven crank, direct crank or chain-driven crank), spring (vertical lift, drag, stretch or recovery), and power (electric, air or hydraulic). Roller Position comes in SR for drag (standard), VR for lift, and TR for stretch or wall-mount, depending on how the hose or cable pays out from the reel. A Reverse Spring Location is also available if your installation requires it. Optional Auxiliary Rewind Positions: Horizontal position is standard, but vertical and 30° angle may be specified at an additional cost. Installation Options: Various options are available for floor, wall or ceiling mounted reels as well as vehicle, trailer or cart installed reels. Location of Components: Hub assembly and motor location options are available, right top rewind is standard, left top rewind, right bottom rewind and left bottom rewind are all options. Optional Motor Locations: Bottom rear position is standard, with options for bottom front, elevated 2 o’clock, elevated 10 o’clock, and inboard (for ESF firefighting reels only). Construction: Frames, discs, and drum are fabricated of heavy-gauge steel. Bearings are self-aligning. Hose Reel Construction: Malleable iron and steel are used for hose reel hub assembly, outlet riser, and swivel joints. Stainless steel, aluminum, and special swivel joint packing can be supplied to meet special requirements. Cable Reel Construction: Collector ring housings are ABS plastic or insulated steel, depending on model. Finish: Standard finish is oven-cured enamel. Finishes other than standard, such as special primers, may be specified at an additional cost. Hose Specifications: Type (single or dual), internal diameter (I.D. ), length, bend radius, and operating temperature and pressure of hose contents and what fluid you will be running through it. Cable Specifications: Outside diameter (O.D. ), length, bend radius, number of conductors, and amperage/voltage needed for your application. When space permits, select a reel with greater capacity than what is actually needed. This allows you to rewind with less care and keeps the hose or cable well protected, even if it is not wound in uniform coils. In most cases, the larger reel within the same series is the same price. Visit the Hannay Reel Selector to start your search. For a deeper dive into determining the right reel for you visit the Spec & Ordering Support page for cable and hose reel spec sheets and helpful videos to walk you through spec&apos;ing your reel. Our reels are used for applications across many industries – from agriculture and aviation to transportation and waste management. 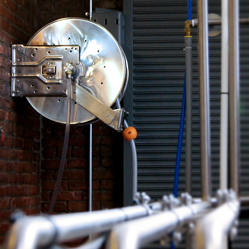 It helps to consider needs specific to your industry, as well as your intended hose or cable applications. What If I Can&apos;t Find the Right Reel? We have been manufacturing reels since 1933, and the hose and cable reels listed in our print and online catalogs are most in demand. But because our reels are assembled from a stock of standard components, we can customize a reel to your specific requirements. If you have a need for an extremely large reel or complicated application Hannay Reels can help. Please visit The Custom Shop for more information on specialty reels. If you can’t find a model that fits your needs, contact Hannay today to discuss your specific reel needs.